The study, “Will a hiding box provide stress reduction for shelter cats,” tested 19 cats who were brought into a Dutch animal shelter. Ten cats were given a hiding box, and nine cats (the control group) were not. 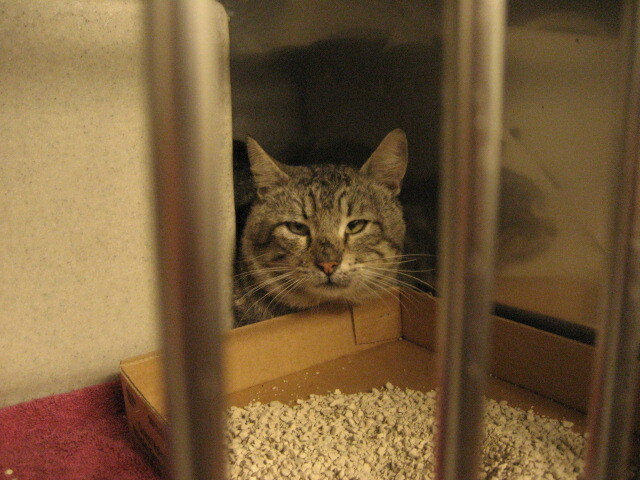 The hiding box had two entrances and was placed in the back of the cage before cats were placed in it. All cages also had a litterbox, three towels, and a water and food dish. Researchers measured the stress levels of the cats using a metric known as the Cat-Stress-Score (CSS). The CSS looks at the postures of the body, belly, legs, tail, heads, eyes and ears, as well as the activity level of the cat to determine an overall stress level. This observational method of assessing stress in cats may be less reliable than physiological measures (such as blood cortisol levels), but the advantage is that the CSS is a non-invasive way of measuring stress without INCREASING stress (as blood draws might do). The floor is open for comments as to whether or not the CSS is the best way to collect the data in question! The study also observed where the cats were spending their time, basically creating an activity budget of where in the cage the cats were hanging out: on the shelf that was part of the cage, in the hiding box, lying behind their litterbox or “somewhere else” (not too many options in a small cage!). This information was both to see preferences in the cats (e.g. 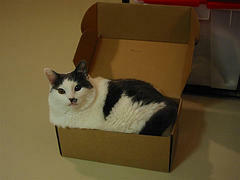 perch vs. box) but also to examine the functions those places might serve (hiding vs. comfort vs. vantage point). Cats may hide behind their litterbox if they don't have any other options. 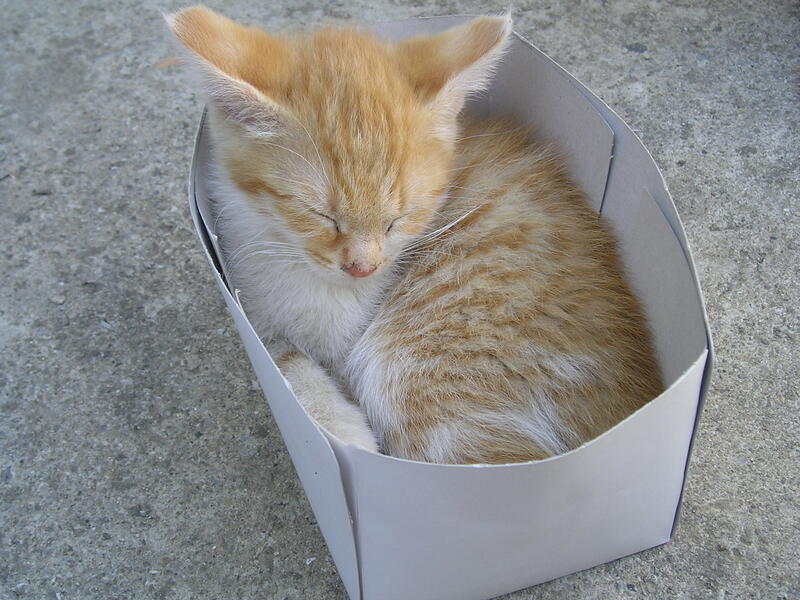 Results supported that the hiding box decreased stress in the group of cats that had them. By days three and four, their CSS scores were significantly lower than the control group (note: by fourteen days, both groups of cats had similar stress scores). The findings also demonstrated a strong need for a hiding space. The cats with a hiding box spent 55% of their time in the box. Cats without a hiding box spent almost as much time (45% of observations) lying behind their litterbox, suggesting that cats deprived of an appropriate hiding space will make the best use they can of available materials to find a place to hide (even if it’s not a very good place). The findings also demonstrated that it wasn’t enough to have bedding (previous research showed that cats prefer a towel as a substrate to lie on). The cats really wanted to be IN that box! Now earlier on, I said that boxes may save lives. How? Cats, even ones that were loving, well-adjusted pets a day ago, often experience extreme levels of stress and fear in new environments. This behavior has some evolutionary origins (as predators AND prey, cats are vulnerable in unfamiliar situations) as well as some human-caused ones, such as lack of early socialization. Many pet cats rarely leave their home, and may not have been exposed to strange people, other animals, or the types of handling encountered upon impound in a shelter (such as medical examination). 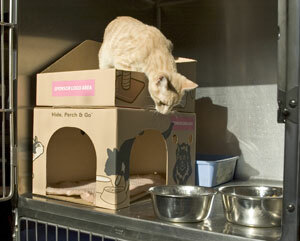 The Perch and Go box is designed for shelters to provide a hiding and perching spot for cats. It even turns into a temporary carrier! From the BCSPCA. Most cats in shelters are deemed either behaviorally adoptable or not within the first week (holding periods of three days are common). So cats that aren’t adapting to the stress of being in a shelter are at high risk of euthanasia. While 14 days seems to be a good amount of time for most cats to adjust, most cats (and shelters) don’t have that much time. An acceptable hiding spot may improve the welfare of shelter cats and perhaps the stress reduction that box provides will improve cats’ chances of making it to the adoption floor. Hiding spaces aren’t the worst idea for your cats at home either (especially if you’re bringing a new cat home)! The box-loving behavior starts at a young age. Despite some clunkiness (a small sample size, and perhaps an unsophisticated measure of stress), this study adds to a growing body of literature exploring the stressors that cats face in shelters, why they are so stressed, and how that stress can be reduced. A hiding space for shelter cats should be considered just as important as providing them with food, water and a litterbox. And maybe once adopted, the cats will go back to playing in boxes instead of hiding in them! This information reminds me of a story one of our MeowSpace owners shared with me about a year ago. He has four MeowSpaces, and he has one cat that uses the MeowSpace exclusively as a private hiding box. Out of curiosity, he put one of his other boxes up next to it, and removed the door, but placed food and her favorite blanket in the one without the actual door. To his astonishment, his cat would go into the one without the door to eat, but would use only the MeowSpace with the locking door (and no blanket) to rest. Seems she understood that the door was what made the difference in her sense of safety. The see-through nature of the MeowSpace was also not a detriment to the cat feeling safe (which we have found to be true from other customers). I wonder if the same researchers could add that element to another project. Many of the new designs for shelters and clinics are using plastic see-through cages. FAKT.CO - Fakt ist... | Jeder Katzenliebhaber weiß, dass Katzen Kisten mögen. Doch du ahnst nicht, zu was das führen kann.